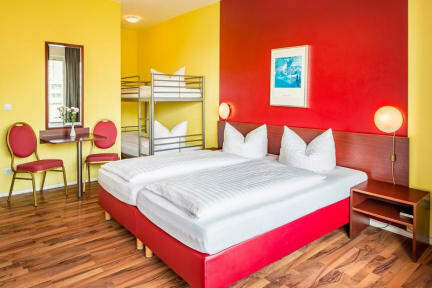 Alecsa Hotel am Olympiastadion i Berlin, Tyskland : Boka nu! 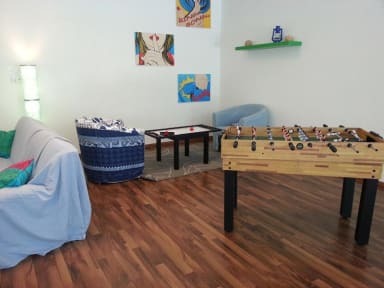 Functional rooms (no air-conditioning) feature wood floors, and some include desks and bunk beds. Wi-Fi is available. Room service is offered. Children aged 0 to 6 years can have an extra bed as well as breakfast for free. Children aged 7 to 12 years can have an extra bed for €7.50 and breakfast for €4.50, to be paid on arrival. Children aged 13 years and over need to pay €15 for an extra bed and €9 for breakfast. Payment upon arrival by cash, credit cards, debit cards (Only Visa and Mastercards). This property may pre-authorise your card before arrival. Age restriction: Persons under 18 years may arrive only when accompanied by at least one adult. Child friendly. Ett mycket enkelt hotel; valskott och rent. Laget ar bra och området tyst. Jag motte genomgående en mycket service minded, uppmärksam och hjälpsam personal; allt från reception, servering och städning. En utmärkt frukost i relation till priset. For den som reser mycket och inte vill lagga pengarna pa övernattning, ar detta en mycket bra hotell, som jag kan rekommendera.